You know how I feel about your beliefs. I would be perfectly willing to let your beliefs alone, though, if you would stop trying to dress them up as science, or even worse, "real science." But, I would like to point out a couple of subjects you should just avoid mentioning altogether if you want to retain even the appearance of credibility. Honestly, everyone who's paid any attention should know by now about Andrea Barnes, the woman who, in the film In Search Of the Edge, goes on a quest to find the edge of the Earth and is lost in Antartica, leaving nothing but a note, which is found three decades later, saying, "I have been there, the debate finally comes to an end," and a camera which is inadvertently opened, spoiling the film. What you should certainly know by now is that Andrea Barnes and her story are fiction, not a hoax but a mock documentary created under the auspices of the Canadian Film Board for the purpose of teaching Canadian students critical thinking skills. There are clues scattered throughout the film that it is completely bogus, and the disclaimer at the end notes that all the characters are fictional, save for some of the on-screen talent and famous scientists from the past. So, if you're tempted to use the story of Andrea Barnes to show that Antarctica is not a continent, but an impenetrable ice ring, resist the temptation. Last February, Jarle Andhøy and Samuel Massie set off from the yacht Berserk II in McMurdo Sound on the Antarctic coast in an attempt to drive ATVs towards the South Pole. Shortly thereafter, in an Antarctic storm, the EPIRB [emergency position indicating radiobeacon] from the Berserk II was activated. Following an extensive search by the New Zealand Coast Guard and private ships, the only sign of the yacht or the three crew aboard was debris and an empty life raft. Andhøy's ill-fated expedition was mounted without authorization or insurance. He later paid a fine of 25,000 NOK to the Norwegian Polar Institute. It is important to note that 25,000 Norwegian kroner is about $3,000US. Jarle is still out on the high seas and getting in trouble with the law, but nothing that's killed him or even put him behind bars. I don't know where this one started, but it's long past its prime. There are two problems with the argument that moonlight is cold, and therefore the moon shines by its own light and not the light of the sun. The first problem is that it's simply not true. Experiments designed to test this end up only demonstrating that something used to shade a thermometer from moonlight ends up trapping the heat rising from the ground from the day's sunshine. Even a flat-Earther, who did the obvious control of repeating the experiment during the new moon, concluded that cold moonlight is a non-starter. There are lots of videos on YouTube purporting to show that the moon is closer to Earth than the clouds. They are shots of a big, featureless, fuzzy white moon, with clouds passing by and not showing up in front of it. Of course, this can only be seen when the cloud cover is very thin, and the reason is simple: the moon is shining light through the clouds. If the shot were exposed for the moon instead of the clouds, you might be able to see them in front of the moon, but not easily because they are so thin, This never works with thick cloud cover. I've lost count of how many videos I've seen showing the sun in the sky at the same time as the moon, with some comment about how the moon should be full, or how the moon isn't pointed toward the sun. Okay, here's a basic rule about trying to overturn a standard model of anything: you can't debunk something by misrepresenting it. In the standard model of the solar system, the moon is a quarter million miles away, and the sun in around 93 million miles away. It's not going to look as if they are at the same distance. It just doesn't work that way. And moon phases are not caused by the Earth's shadow on the moon. That's an eclipse. If you can't figure out what you're seeing in the sky, get a book on astronomy. If you still think it doesn't match up, then you make your own model that makes it work. But don't think you're onto something just because you don't understand what you're looking at. You must know this story by now. A woman went into labor on a flight from Bali to Los Angeles. The pilot diverted to Alaska, but the baby was born on the plane before the plane landed. Flat-Earthers made a big deal, doing videos that showed how the plane was going way out of the way on the globe map, but right on the way on the flat-Earth map. So if you're tempted to trot out the story of the baby born on the plane, just don't. 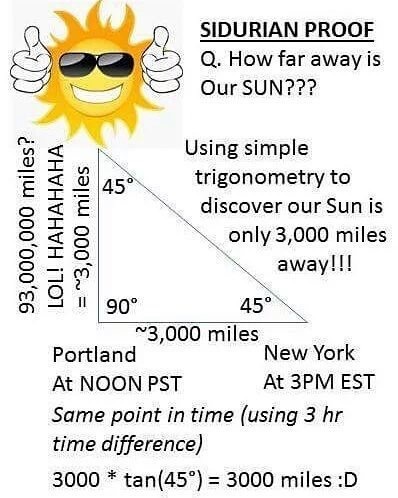 In fact, any time you're thinking about using the Mercator projection to make a point about the globe, just stop. You're comparing one distorted projection to another, and it's making you look ignorant or dishonest. This has been a public service message. Carry on. When flat-Earthers talk about the shape of the Earth, most of them propose that it is a disc, with the North Pole as the center, and what we think is the South Pole around the rim, forming a great ice wall. As I showed on my previous post, the idea is that the sun and moon circle around the disc and create day and night, and somehow moon phases and eclipses. Look! there it is! North Pole in the middle, big ice ring around the perimeter. The flat Earth! Well, maybe. Closer examination reveals a few clues. The first is in the upper left corner, where is says: Longitude and Time Calculator. There is also that weird something sticking out from the center, that seems to be riveted in the middle and torn off at around 30 degrees north. What is that for? And there are numbers around the rim that must serve some function. More telling, especially to anyone who's had a little bit of cartography education, is one very important word near the top. It says that this map is "On the Projection of J. S. Christopher, Modern College, Blackheath, England." Projection means that it is derived from some other shape, like maybe a globe. Flat-Earthers make much of the words "As It Is" and "Scientifically and Practically Correct," and even more of the descriptions of the motion of the sun in the lower corners. But what did Gleason have to say about it? Do we know? The map is not so extorted as to lose the relative latitude and longitude of any places on the land or sea, but retains all latitudes and longitudes of places agreeing with other recognized authors; and as the proper relations of continents and countries all stand in their relative position to each other, they are thus impressed upon the mind of the student. The extorsion of the map from that of a globe consists, mainly in the straightening out of the meridian lines allowing each to retain their original value from Greenwich, the equator to the two poles. 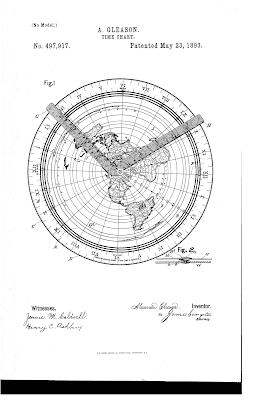 The use of "extorted" in the sense of "distorted" is interesting here, but the intent is clear; the map is not "as it is" (which I think may have been a slogan of the map's publisher), but a projection that preserves the positions with regard to longitude lines, but not the distances between them (distances between lines of latitude, however, are preserved). And note his phrasing "the equator to the two poles." A flat Earth does not have poles. 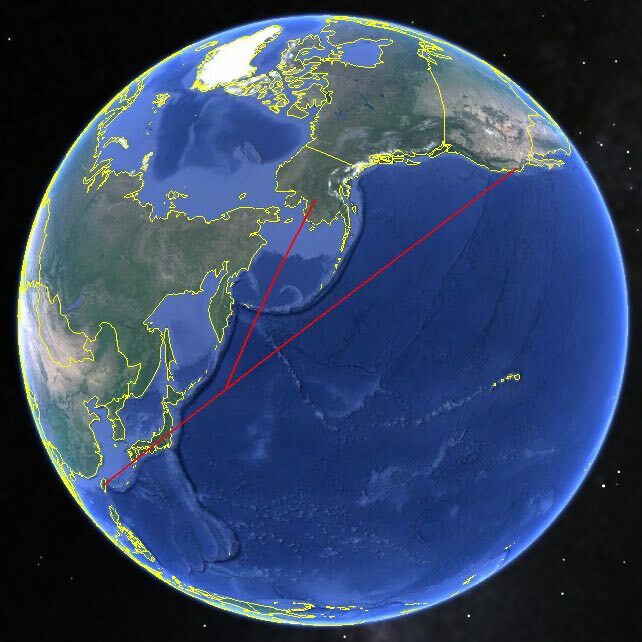 This type of projection is know as an azimuthal equidistant projection, and when properly used it has many applications in navigation, telecommunications, and even military planning. The projection method has been known for about 1000 years. Azimuthal projections are not always centered on the North Pole; they can be generated mathematically from any point on the globe. You can generate one for yourself online. The fact that so many flat-Earthers automatically dub this a "flat-Earth map" everywhere they see it shows a profound lack of willingness to do deep research, and a penchant for jumping onto bandwagons. I think Gleason would be appalled. ADDENDUM: Well, apparently I was wrong about Gleason. He really was a flat-Earther after all. I will do a full post on this when I get the chance. 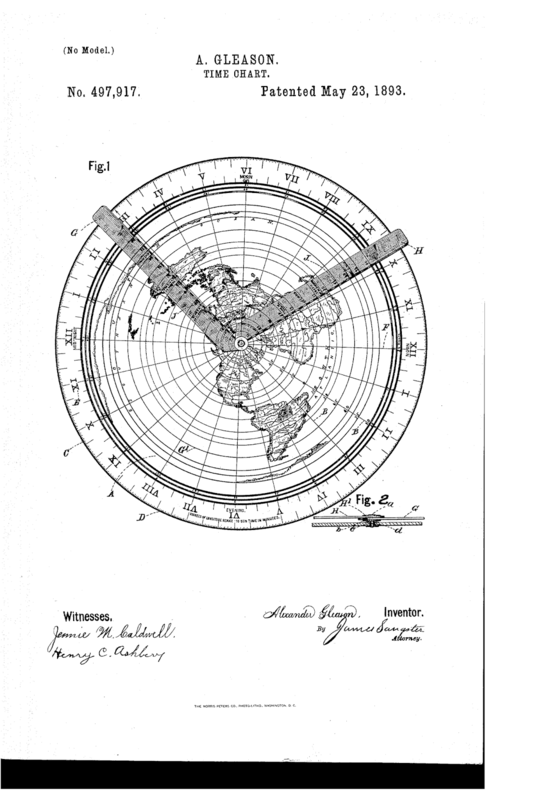 So why did the patent examiners of several nations grant a patent to a flat-Earth map? Because the patent application conveniently left that little detail out. More to follow, along with revisions to this post. One of the most frustrating things about dealing with flat-Earthers is the way they will suddenly change the subject from whatever you were talking about to a completely new line of thought. 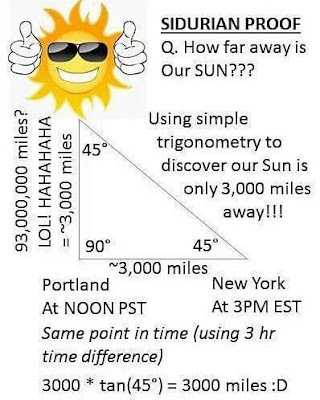 I saw an example of this on Twitter recently when the question of seeing the North Star, Polaris, from Reunion Island, which is more than 21 degrees south of the equator, came up out of nowhere. This is, of course, impossible. There was an illustration, showing that this is impossible. But no proof that it had ever actually happened. The poster just took it as read. So I decided to find out where the story came from. A little searching brought me to the only place I can find where anyone claims that Polaris has ever been seen from Reunion Island: a massive book called The Greatest Lie On Earth: Proof That Our World Is Not a Moving Globe by Edward Hendrie. There is no other source for this claim, even on flat-Earth websites. Below is a time lapse photograph of the North Star (Polaris). The photograph was taken in October, 2008, from the Le Make Reunion Astronomical Observatory on Reunion Island.100 That observatory is at an altitude of 4,921 feet and is located at 55.39° east longitude and 21.5° south latitude. The photograph was taken by Laurent Foumet and lean-Philippe Olive, who are members of the Club Astro Astrium in Toulouse, France. Olive and Foumet used an Olympus camera, 28mm f/8 lens, 2 hours and 40 minutes exposure time; Ektachrome 210 ASA film. Note how detailed this is, how it looks so accurate and well thought-out. It even has a source reference. Very convincing. Except for two things: the photograph, which I will give you the link to presently, which shows, in the center of the star trails, not a bright star, but a dim cluster; and second, that I know what is described is impossible. So, let's check out that reference. Hmm. Seems that this picture is not of Polaris at all. It says right in the text that these are southern circumpolar stars. So, is Hendrie just missing something? Or was he just counting on everyone who read the text not bothering to check the reference? In either case, it seems that anyone who writes a 400-page book claiming that the Earth is not a globe should have a better standard of evidence.